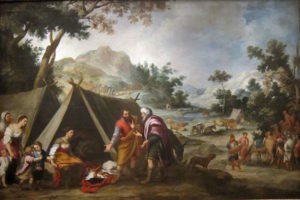 The main storyline of Genesis 31 features the departure of Jacob and his family from Laban, Jacob’s father-in-law. Included in this narrative is a minor story of Rachel stealing her father’s “household gods.” This is a strange and sad tale, since it involves a daughter stealing from and deceiving her father. Yet, I believe this aspect of Genesis 31 can speak to us about our relationship with God. Genesis tells us that Rachel took her father’s “household gods” without his permission while he was away shearing his sheep (31:19). These “gods” may have been small images of divine beings or perhaps Laban’s ancestors. Rachel packed them away as she followed Jacob to his homeland. When Laban caught up with Jacob and his entourage, he accused Jacob of stealing his “gods.” Jacob, who was unaware that Rachel had taken them, swore that he did not take them and that the one who did would be worthy of death (31:32). But when Laban searched all of Jacob’s belongings, Rachel managed to deceive her father so that he did not recover his “gods.” Finally, realizing that God was on Jacob’s side, Laban offered to make a covenant with Jacob so that all might live in peace. Chapter 31 concludes with Laban kissing his daughters and grandchildren goodbye as they departed from his presence (31:55). As I reflect on this part of the story, I am reminded of how hard it can be to trust God. Genesis does not tell us why Rachel stole her father’s gods, but it’s likely that she did so as insurance for her future and that of her family. No matter the precise benefit Rachel believed the gods would provide, she sought this benefit just in case trusting the Lord was not quite good enough. Can you relate to Rachel’s motivation here? I certainly can. I am fine with trusting God with my life. But sometimes I want to maintain control over my life in ways that limit my trust in the Lord. I don’t steal anybody’s household gods. But I do put too much confidence in my own ability to act independent of God’s guidance. Or, I offer some problem to the Lord in prayer, only to take it right back by worrying. As I move forward in my life, I want to trust God more and not hide away some handy “gods” just in case the Lord is not good enough. I want to trust God with everything. As you read the story of Rachel’s stealing her father’s “gods,” how do you react? When do you find it hard to trust God? If you were to trust God more fully today, what difference might this make in your life and leadership? Gracious God, as I reflect on this story from Genesis, I can see myself in Rachel. There are times when trusting you is scary, times when I’d like to hang onto a few of my own “household gods.” Forgive me, Lord, for my lack of faith. Help me, I pray, to trust you more consistently and more deeply. Amen. Image Credit: “‘Laban Searching for his Stolen Household Gods’ by Bartolomé Esteban Murillo, c. 1665-70” by Bartolomé Esteban Murillo – Own work Wmpearl. Licensed under CC0 via Wikimedia Commons.